A lovely list of fashionables were in attendance for ‘An Evening Honoring Valentino’ black-tie gala at Lincoln Center’s Alice Tully Hall in New York City on Monday (December 7), where Valentino confections were the dress code of the night, naturally. Diane Kruger: A sense of noir-inspired mystery was alive and well in the actress’s Valentino Fall 2015 Couture feathered gown, which was intricately embroidered throughout and dramatically elevated by the cape. The statement pendant necklace surprisingly isn’t too far overboard, working with the dark extravagance here. Instead, I would remove the one-earring effect. A Rauwolf box clutch completed the look. Olivia Palermo: Solemnly sophisticated, Olivia donned a Valentino Fall 2015 black gown embellished in an array of golden geometry for a tapestry-like effect. Needing little in the way of accessories, she complied with a more subdued clutch and a simple, slicked-back ponytail and headband. 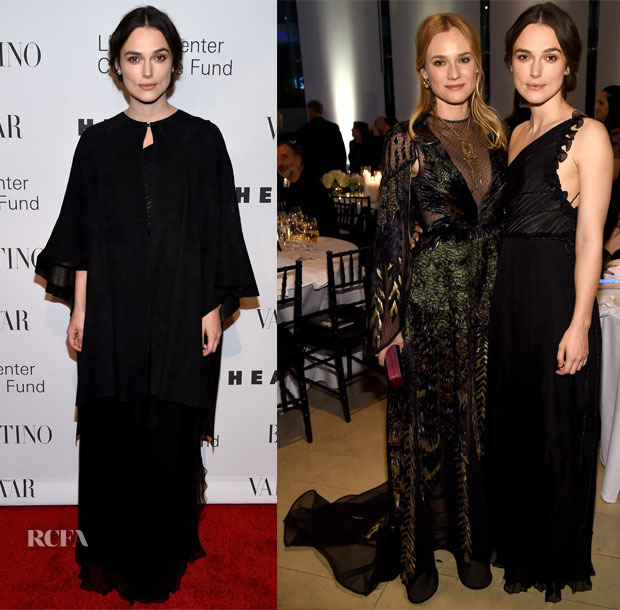 Keira Knightley: Also in an ensemble from the Valentino Fall 2015 Couture collection, she left the hyper embellishment for the others, instead opting for an all-black gown and cape. I’m so glad she removed the rather sombre cape as the one-shoulder gown underneath featured slightly more personality. Nicky Hilton: The exact opposite of Keira, Nicky embraced an array of vibrant hues in her Valentino Spring 2016 long-sleeve gown rendered in a slightly tribal, mosaic-style effect. I would have skipped the headband but the baby-blue, red, and marigold hues were a bright, heady rush of colour on this darker, moody red carpet. Liv Tyler: Following the black theme, Liv wore a Valentino Fall 2015 gown enlivened by a bouquet of mini flora. A pulled-back ’do would have helped the sleekness factor here, given the heavier quality of the dress.